I always wanted to be a fishing guide. Maybe I always was when you consider the luckless cohorts, cousins and relations who I suckered into crawling along a hornet infested, brush-choked creek in search of a six-inch cutthroat when I was a kid. Once we fished the creek out, we fished a bigger creek. It is difficult to drive over the treacherous Morse Creek bridge and the devil’s racetrack on either side of it these days without remembering how things used to look in the old days. Valley in a feat that has yet to be duplicated. and harvest, can and smoke enough salmon to last the winter. was unsporting, so we shot them with bows and arrows. fishing with poles after that. Then one day Morse Creek turned brown right in the middle of summer. This was strange since the creek was still low and we had no rain. volcano. Why can’t salmon survive in Morse Creek? back, but that has never worked anywhere. than as food for people. the Olympic Peninsula my whole life and have not seen parts of it yet. Irish elk was a giant of the deer family with antlers eight feet wide. the land until parts of Ireland were eroded down to bare limestone. extinct and salmon were no longer a food source for the common people. The fish and whatever game that was left was owned by feudal lords. colonies or herded into sharecropper plots to grow potatoes. geometrically while their subsistence increased arithmetically. already consumed most of the rest of Ireland. At the time we were named O’Neal. It was most likely a British name. population of the American Colonies got here. resistance to the British Army in the state of South Carolina. deer were slaughtered over the mineral licks. Alabama and Georgia — for lands west of the Mississippi River. people died on the journey. Idaho, 640 acres, 160 acres to his wife and another 160 to each child. Neals headed west sure that it would. a journal that has survived to the present. fur trade between the Rockies and the Sierra Nevada Mountains. Upon his return to Fort Laramie, Clyman met many California emigrants. Party did not listen. The Neals did not listen much better. and potatoes in a land stripped of game. running loose to graze, 15 or 20 could be missing in the morning. in the rain for a day. Moving out onto the Great Plains, we ran into vast herds of buffalo. guarded the women on expeditions picking berries, plums and cherries. were $1.50 a day and land went for $5 an acre. and west to the Olympic Peninsula where I live today. 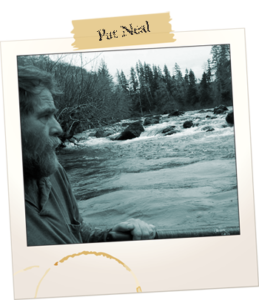 moved to a home along the Sol Duc River. through one of the most tumultuous periods of American history. build out on the Pacific Coast. while I would bomb my own fort with dirt clods just for fun. last we ever saw of U.S. Supreme Court Justice William O. Douglas. woolies and change the straw in your bed. trucks that delivered 200 loads of logs into Port Angeles every day. and a half deep when it was blown up. I thought that was the funniest thing I ever heard. I knew it: the first day of school. me to know about school. “What if you have to go to the bathroom?” I asked. teachers who I try to avoid to this day. morning before you got on the bus. old National Geographics that would have made Caligula blush. a drink but that’s all there was. pens, which could shoot ink quite a way when you got them sighted in. school looking like a modern art painting. that out, but the know-it-all teachers just laughed. news was that all my friends would be there. everything from baptisms to funerals. altar boy meant you could skip a lot of school on religious grounds. at midnight on Christmas Eve or Easter while we went almost every day. Never mind that we were sneaking the sacramental wine, what the heck. morning was no big deal. altar boy: flatulence. You had only one chance to get away with it. report card hung in my gut like a chunk of lead. plan on missing your classmates all summer long if at all possible. one noticed the bugs once the skunk showed up. to go hi-tech. I had to get a tent. hatches when the bad weather hit. I’ll never forget that first and last night under the shower curtain. We’d slogged into a high mountain lake right when the ice was off. curtain and waited until dawn. Back then summer vacation wasn’t all just camping and fishing. careers to choose from, and I couldn’t wait get started. summer morning, gorging down an endless row of perfectly ripe berries. gave their kids credits cards to manage their money. was asking for it by throwing berries at you. No. Revenge could wait. as soon chew on a dirt clod. anything about swapping boxes with them. trick but my friend had it coming. We both did. and if you ate all the berries you picked you paid in many ways. news. The good news was it was probably the only shade in the field. rocks in my berries. I’d been sucker-boxed! I went on to pick many other crops after that — berries, beans and peas. Grandma would come for a visit. not skimp on the butter. of clams then go out for burgers in a little shack right on the beach. Springs road and fish the holes along the road. Herter’s spinner. Grandma made it out okay though. of trout. A Grandma Neal shore lunch was a banquet fit for a king. After lunch we’d head out for another limit while Grandma took a nap. another basket of trout, then style back home for a fish fry. was. Those were fighting words at the time. “Your Grandma doesn’t fish,” a punk who used to be my friend said. supporting the local bingo games. It might have affected her health. heaven took a severe hit. could take an education away from you. Those words stayed with me. heads, trolled for salmon, cut shake bolts. I got a job thinning trees in the Forks Burn up on Bonidu Mountain. fir and hemlock so they would grow faster. worked the same land. I thought that was pretty cool. Boone didn’t know about the Dungeness wasn’t worth knowing. thought I would write about it someday, so here goes. creek, hollow and knob along the way. girlfriends. That’s what Harry said anyway. wouldn’t hit until the next day. in sugar and salt. Once in a while Harry would get fancy. he let me catch a fish once in a while. homesteads that used to populate the last frontier. and killed the moonshiner’s market. valley. Harry would find what was left with his metal detector. really taking off at the time. from a lack of wood. salmon and steelhead and have fished ever since.